Reprint. Originally published: London: Jonathan Cape, 1991. Little Billy's mum says he must never go out through the garden gate and explore the dark forest beyond. So, one day, that's exactgly what he does. There he meets the Minpins: miniature people who live int he hollow trees. They soon warn Little Billy of the fearsome, galloping Gruncher, who has grunched thousands of Minpins. And it will gobble up Little Billy too - uness he can find a way to defeat the hungry beast, once and for all... 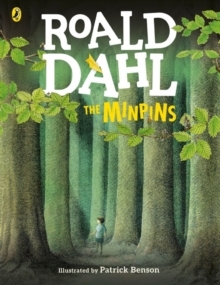 Listen to THE MINPINS (with THE MAGIC FINGER) and other Roald Dahl audiobooks read by some very famous voices, including Kate Winslet, David Walliams and Steven Fry - plus there are added squelchy soundeffects from Pinewood Studios!